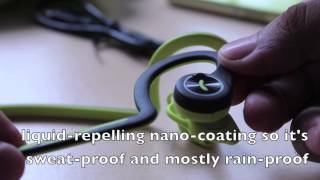 The sporty BackBeat Fit headset offers a sweat-proof design and solid battery life. Expect decent sound quality from this product. 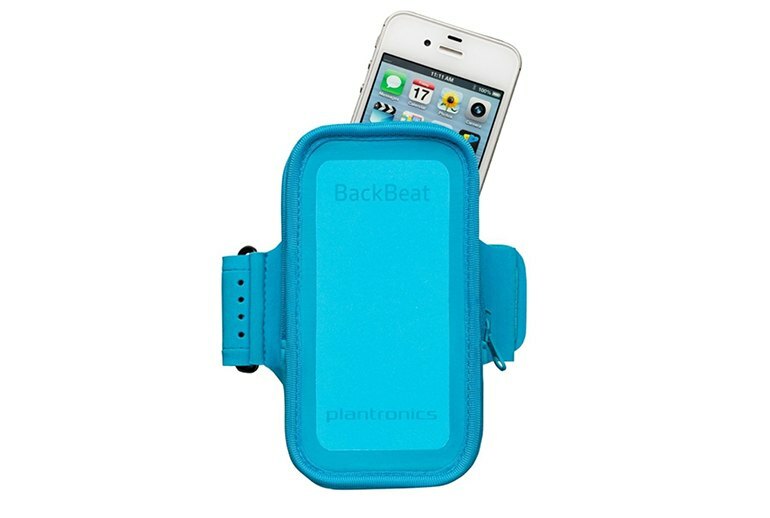 A neoprene armband and storage case combo is included with the price. Runners might find that the chord at the back of your neck flops around. Depending on your tolerance level, the unit may feel uncomfortable after long periods of use. The call quality was not always impressive. 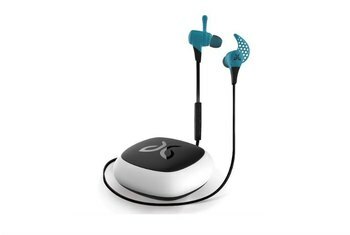 Designed for workout warriors, this Bluetooth headset promises waterproof durability, an awareness of the world around you, and eight hours of battery life. On-ear controls through the left and right pads let you adjust volume, manage tracks, accept, end, and mute calls--and activate Siri or Google voice commands. The armband doubles as a storage pouch when you turn it inside out. 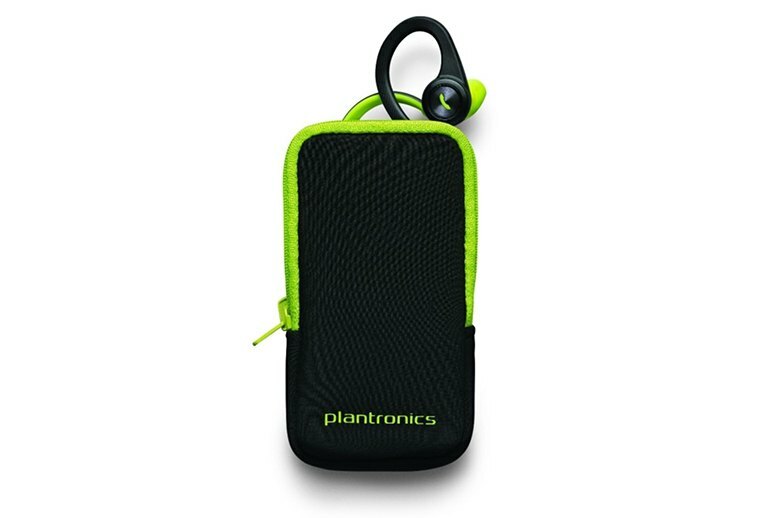 With Plantronics smartphone apps, you can update the firmware, use features, and track down your BackBeat Fit. [T]he neckband is the worst aspect of the design. While it's flexible, it's very short and nonadjustable. Every time we looked up, the neckband would pull the earbuds off, which is the last thing you want when you're on a run. 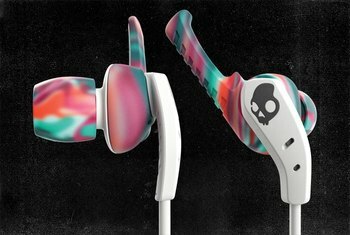 I know that when I’m at a club I love the feeling of bass, but these are in-ear headphones and you don’t want thumping amounts of bass. The product is really nice to wear for long periods of time, and the handy carry case really levels the product out to a perfect purchase. The included device-agnostic armband is good enough to use when needed, though far from the best we’ve seen for specific iPhone or iPod models. The lack of a hermetic seal here is a feature, according to Plantronics, so that runners can hear approaching traffic. Overall, it's a fairly flat sound with plenty of low end, but nothing Beats-esque here. It's quality without being overt. Given the sporting target market, that's pretty good. The buds are connected with a flexible band and the whole package is sweat-proof. For me anyway, they fit securely and I thought they were comfortable to wear after I fiddled around with the angle of the tip. It’s important to note the music is never really in your ears and totally immersive, with the outside world easily heard as you're wearing them. This is a good thing, and is part of the way Plantronics have designed the Backbeat Fit, making it ideal to hear people and your environment. 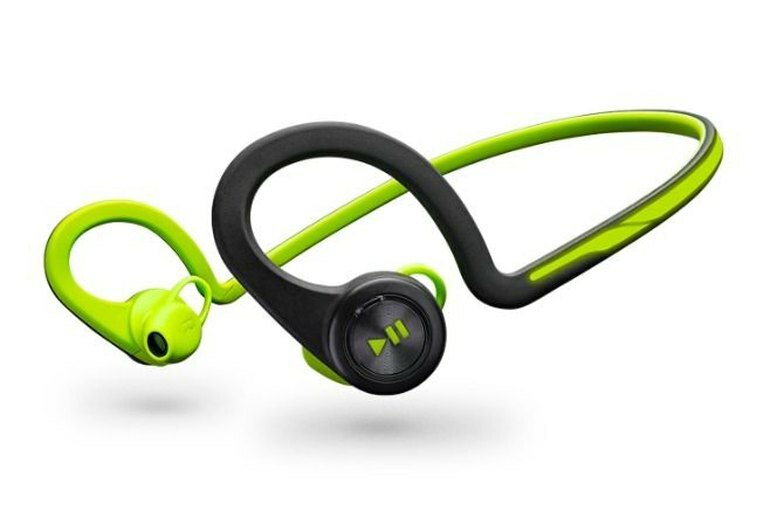 The Plantronics BackBeat Fit is an excellent, gym-friendly Bluetooth headphone pair that comes with a handy armband that can hold your phone while you run. It lacks a bit of low-end, but it doesn't distort, and lets just enough sound bleed through to maintain situational awareness. While I was fitting the right earpiece, I accidentally set the earphones to Mute. Controlling volume was problematic, too. To increase the volume, you tap the Volume button, but to turn it down, you have to press and hold the same button. This means the volume goes up slightly before it goes back down again. Let's first talk call quality. We've got to say that we were disappointed, though the in-ear speakers proved noticeably inferior in comparison with the microphone. We were hearing the other side as if a very long-distance fixed line call was taking place, with overall very poor quality. 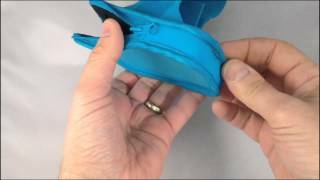 Even if you have a large head to the point where you need a prescription hat, the device isn't going to fit. The band is lax when wrapped around the back of your head, enough to create a one-inch gap of space; running creates a slight bobbing sensation. 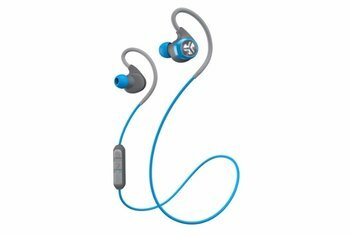 You can really feel the deep bass with these earbuds which is something you don’t get with a lot of high end earbuds. So if you like house music, EDM, hip-hop or any music that has accentuated bass then you will be completely satisfied using these headphones. The sound that the Plantronics BackBeat FIT produces is not especially musical — there’s no deep, booming bass and no huge amount of detail in the midrange or treble — but for listening to the regular stable of workout tunes it does a perfectly adequate job. The Plantronics BackBeat Fit won’t win any audiophile awards, but it has a clean, pleasant sound that makes it a dramatic upgrade from stock earbuds or a pair of $30 Bluetooth headphones. Even the bass is satisfying for a sound system that needs to entertain you while you run a 5K or bike around town. 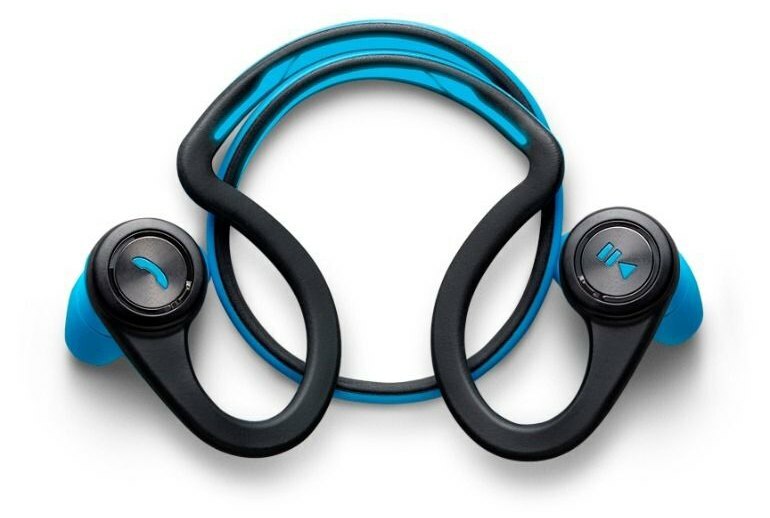 The only real gripe we have with the BackBeat FIT is the price. At £102 [$129.99] the headphones are not cheap. Sport headphones are often a supplementary pair, used exclusively for exercise scenarios where sweat-proofing and secure fittings are the most important factors. 100% Said they'd buy it again. This represents the best package I have found for high-quality workout headphones. The sound quality is very good (somewhere similar to Seinnheiser 280s -- not quite as good as the Bowers & Wilkins P5, but surprisingly good). The microphone quality when making calls is better than my previous bluetooth headset (and better than the standard iPhone earbuds). The battery life has never let me down: they kept rocking for 6+ hours of long trail runs without letting up. I would buy the neoprene armband as a standalone item too. Personally, I don't understand the complaints that the head strap is not adjustable: this design of earbud by any manufacturer has always been stable and reasonably comfortable for long periods of time. The strap has never bounced around or become annoying in any way. The controls took a few minutes to learn, but my only regret with these is not buying them sooner. 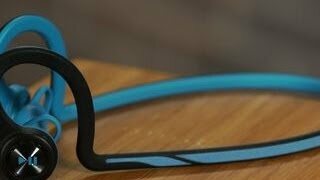 I compared these directly to the Aftershokz Trekz Titanium and I thought they sounded 100 times better. 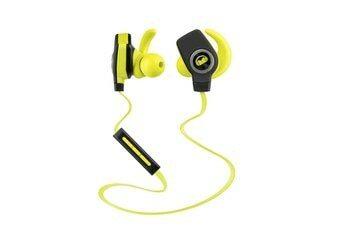 They're not uncomfortable to wear, sound great, and have a reasonable battery life. They're what I wear to exercise now.